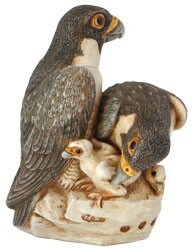 Master Carver Peter Calvesbert is fortunate to have peregrine falcons nesting not far from his home in Worcestershire, England. He made a regular habit of observing them until the single chick left its nest last June – thus the inscription 17/6/7 on the base. The peregrine population has suffered at the hands of man. DDT affected the eggshells, and during WWII peregrines in the UK were shot as it was thought they might eat carrier pigeons. Only about 600 pairs existed at that time. Worldwide recovery efforts have been remarkably successful, and the peregrine falcon was removed from the endangered species list in 1999. At the same time that Peter was observing them, HK collector Lynn Bartz e-mailed him about peregrines in San Jose that he could watch on a webcam. The pair – Jose and Clara - had three chicks that were tagged 71P, 05R and 12Z, later named Hiko, Esperanza and Spirit. All of their names, as well as Lynn’s, are inscribed on the model. The interior shows the three chicks, along with a webcam.